Putting a new set of rotors on the back of the car and having issues trying to get the allen head rotor bolts loose. These are red loctited in. I've already tried heating them up like you normally do with loctite. Also tried heating them up and soaking in WD40 which sometimes works. Hit them with some heat, and immideately with an 18 volt cordless impact. It's not strong enough to break or strip the bolts. But it's enough to kill the loc tite. I may try the impact. I was tempted to this evening but figured I'd round the allen heads out, I think there's a pretty good chance of that happening but maybe I can turn it down low enough not to strip them. I wish I had one of those hammer impact drivers, that would come in pretty handy about now. If the Allen heads are American made black oxide, they are grade 12. They will take a lot of abuse. I also get 25% off anything at ace hardware in Newton. So I can get you a get a deal on one. Plus, Dewalt is replacing all their 18 volt stiff with 20 volt. So you can get the 18 stuff right now at killer prices. I've been to that Ace Speed Shop before haha... Don't worry about it, I'll fiddle around with them some more tomorrow and see if I can make some progress. If I recall correctly, Red Loctite is supposed to release when you get it up to 400 degrees or so. It could be you haven't gotten things warm enough, though who knows. I should have got them plenty hot, not the first time I've done that. John vs Rotor bolts round 2 later today. After screwing around with it for a couple hours, I'm throwing in the towel and getting some new hats. Tried everything including slotting the heads, turning with chisel (breaks head off), drilling them out, heat, oil, more heat lol .. Only way I'm getting these out is drilling them all it looks like. These are some stubborn bolts let me tell ya.. Ordered some new hats today. The guy at Aerospace said there's a couple more things you can try, and that's to make a bunch of radial cuts to the rotor which will relieve some of the stress to the bolts if the rotor is warped. Or end mill the tops of the bolt heads off, course that leaves you with just a little stub to try and get out. By the time I ordered new rotors, bolts, pads & hats I could have probably got a complete new brake set for another 150 bucks and had new calipers too. Grrr..
no Loctite - safety wire! I'm not sure you could safety wire these, the bolt heads are counter sunk into the rotor. Would have to look at a different bolt arrangement, not sure it would clear the caliper. 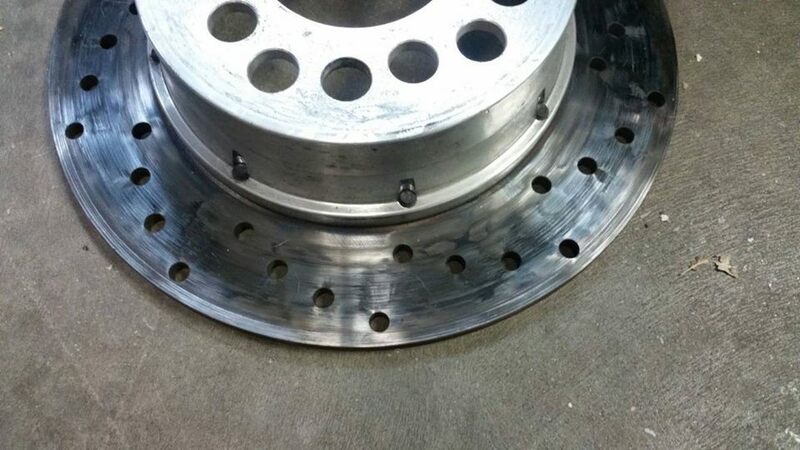 If I win the lottery I'd like to switch these out and replace the brakes with the TBM http://www.tbmbrakes.com/ - Friend of mine Mike Duffy has been using TBM on several cars and they are really good at retracting the pads - low drag.